This fruit is bright green when fully ripe and adds bright acidity to chowders, salsas, soups, and more. The tomatillo [TOH-mah-tee-yo], also known as a Mexican ground cherry, is a member of the nightshade (tomatoes, eggplants) family that is cocooned in a papery husk. This fruit is bright green when fully ripe and adds bright acidity to chowders, salsas, soups, and more. Like most plants in the nightshade family, everything but the fruit of the tomatillo plant is toxic, so the husk must be removed before eating. The papery casing peels right off the fruit, leaving behind a slightly sticky residue that rinses off in cold water. 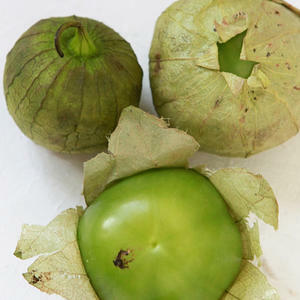 Tomatillos are small with firm flesh and few seeds compared to a large beefsteak tomato. There are heirloom varieties of tomatillo that are purple, red, or gold, but the green tomatillo is most popular and, used raw, is the base for a number of Mexican green sauces, namely salsa verde. Fire-roasted tomatillos have a different level of flavor that's smoky, nutty, and earthy. Tomatillos are a good source of both vitamins A and C.